Order Clearspring Red Miso Soup from the Online Health Food Store UK. Buy Clearspring Instant Red Miso Soup - 4 Sachets and other quality Miso & Miso Products safely online in the UK. This Hearty Red miso soup is made to a traditional Japanese recipe. Red miso base with spring onions and wakame sea vegetable. Miso is a flavourful Japanese soya food that makes a rich, satisfying soup. As official Clearspring stockist in the UK, we sell quality Miso & Miso Products to customers throughout the UK in England, Wales, Scotland and Northern-Ireland. Where to buy Clearspring Red Miso Soup safely online? 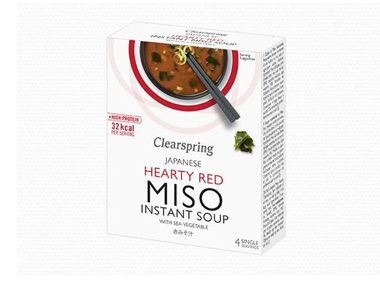 Shop at the Online Health Food Store if you are wondering where you can buy Clearspring Instant Red Miso Soup - 4 Sachets safely online in the United Kingdom. Our Health Shop is located in the UK and our award-winning independent has been serving customers in England, Wales, Scotland and Northern-Ireland since 1976. You can buy our Organic food and other quality Miso & Miso Products online and we post out orders to any UK address. Red Miso Soup - Clearspring Instant Red Miso Soup - 4 Sachets in Miso & Miso Products and Miscelanious Ingredients.